Today I am so happy because I am going to a Michael Jordan game with my mom. 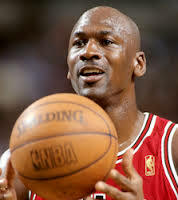 Michael Jordan plays for the Chicago Bulls. The Bulls are my and my mom’s favorite team. Today’s game is in Chicago, so here I come Chicago! When I got to Chicago, I saw Michael Jordan talking to some kids. I asked my mom if I could go talk to Michael Jordan. She said, “I’ll go with you.” When I met him, he told me he had won a slam dunk contest. He was pretty friendly and serious, but mostly fun. When I got home, I looked up where he was born. I couldn’t believe he was born in Brooklyn, New York. My grandpa was born there, too. I found out a lot about him, but when I met him, it was a dream come true! This entry was posted in 2013/14 School Year, Mrs. Dominick's Class. Bookmark the permalink.